Winter themed Poppystamps craft die featuring a frame with a tree. 2.2 x 3.5 inches. Poppy Stamps craft die featuring square frames. Memory Box/Poppy Stamps craft dies are made of 100% steel. For use on cardstock, felt, and fabric. Cut, stencil, emboss, create! Use in most leading die cut systems. Poppystamps craft die featuring deer in a rectangular frame. 2.2 x 3.5 inches. Poppy Stamps craft die featuring 4 circles. 4.25 x 4.25, 3.45 x 3.45, 2.65 x 2.65, 1.85 x 1.85 inches; 10.8 x 10.8, 8.8 x 8.8, 6.7 x 6.7, 4.7 x 4.7 centimeters. Poppy Stamps craft die featuring a square frame with flowers and a circular opening. Memory Box/Poppy Stamps craft dies are made of 100% steel. For use on cardstock, felt, and fabric. Cut, stencil, emboss, create! Use in most leading die cut systems. 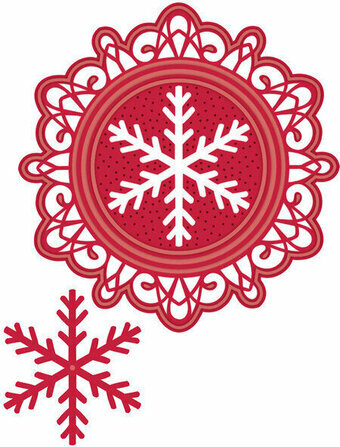 Poppy Stamps craft die featuring a snowy frame. 2.3 x 2.9 inches, 5.8 x 7.4 centimeters. Poppystamps craft die featuring nested Square frames. 4.2 x 4.2, 3.4 x 3.5, 2.7 x 2.7, 1.9 x 1.9 inches. Craft dies featuring rain, the Sun, and the Moon. American-made, precision-etched metal dies create perfect cut-outs using your favorite cutting machine. This die measures 3-3/4" x 5". It cuts 6 nesting frames at once. These are US-made steel dies compatible with most table-top die cutting machines. 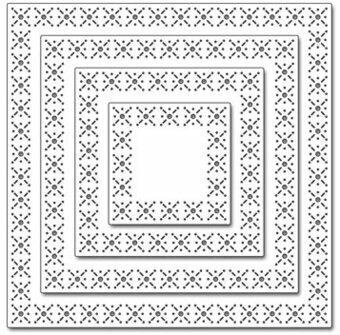 The Rectangle Tangled Frames is a set of 2 frame dies with the largest measuring 3.75" x 5" and the smallest measuring 2.5" x 3.25". There is also a third die in the set: a random mesh design measuring 1.25" x 2", which is great to use as a backdrop for added interest. The open design lends itself to many styles, from steampunk to romantic and anywhere in between. Our Frantic Stamper Precision Dies work in most consumer table top die cutting machines such as the Cuttlebug, Big Shot, vagabond, Boss Cut, and Grand Calibur. Some dies may require the use of a metal shim depending on your machine. We're excited to bring you a fun new mix and match die series. We call these "vignettes", and they can be used in so many versatile ways. 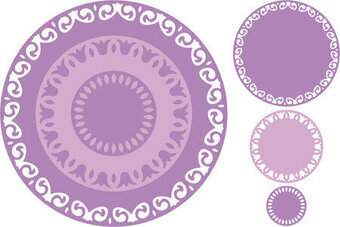 The scalloped circle measures 1.8" in diameter with a 1.25" opening surrounded by a stitch line. Fill the vignettes with small stamped images, or our vignette insert dies (there are many to choose from with more coming in future months). You can now use these elements to build various card layouts. The possibilities are truly endless, so let your imagination run wild. Shapeabilities Bella Rose Lattice Layering Frame Large Etched Dies Chantilly Paper Lace Collection by Becca Feeken is a set of six dies that bring stunning details in every piece. 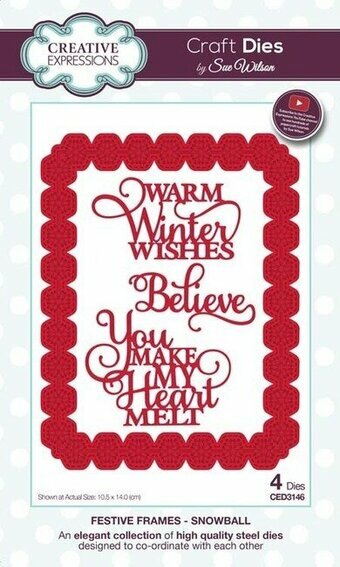 A beautiful addition to your card making collection. 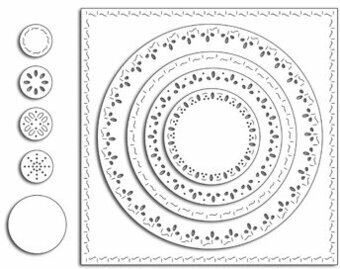 Chantilly Paper Lace Collection by Becca Feeken is a beautiful lace design known for its outlined patterns and ornate details. Bring some of this French style to your projects. Spellbinders Shapeabilities cut, deboss, emboss and stencil with a single etched die template. Approximate Size: Tag: 2.05 x 3.45 in. 5.20 x 8.80 cm, Cat's Eye Insert: 2.35 x 4.95 in. 6.00 x 12.60 cm, Arched Borders (2): 1.90 x 5.20 in. 4.80 x 13.20 cm, Oval Insert: 4.30 x 5.45 in. 10.90 x 13.80 cm, Lattice Frame: 5.05 x 7.05 in. 12.80 x 17.90 cm. This Thinlits Die showcases the inspired style of Jillibean Soup. Their unique artistry can be seen throughout the die which is compatible with the BIGkick, Big Shot and Vagabond machines. Spellbinders is proud to offer the latest designs from the Amazing Paper Grace collection by Becca Feeken. This new line is royally beautiful and richly created, to add grace and elegance to any creative project. 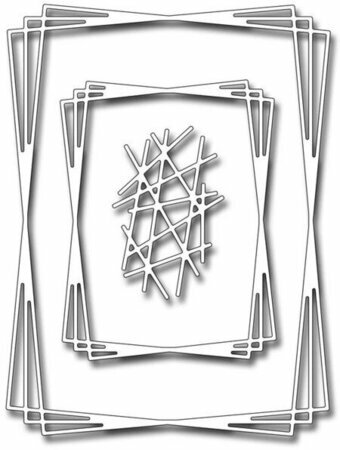 This Cascading Grace designs can be used to create 5 x 7 inch cards. Perfect for Cards, Scrapbook Pages, and More! Shapeabilities Floral Photo Frame Etched Dies Flower Garden by Sharyn Sowell is a set of two dies includes a scalloped edge frame with notched corners to insert your favorite photo, along with a floral and leaf border accent. What grows in your garden? Bring wonderful botanical elements into your projects with the Flower Garden Collection by Sharyn Sowell. Spellbinders Shapeabilities cut, deboss, emboss and stencil with a single etched die template. Approximate Size: Frame: 4.30 x 5.00 in. 10.80 x 12.60 cm, Strip: 3.75 x 1.60 in. 9.50 x 4.10 cm. 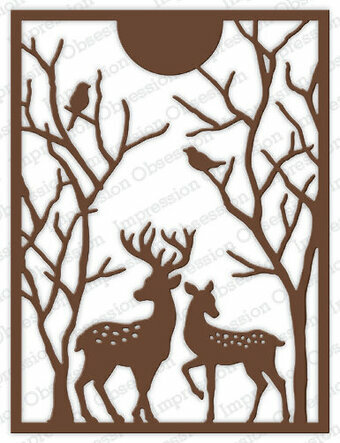 Nature themed Impression Obsession craft die featuring deer in a rectangular frame. These are US-made steel dies compatible with most table-top die cutting machines. This is a set of 2 dies. The large frame measures 4 x 4 inches. And the smaller shape measures 2-1/8 x 2-1/8 inches. Our Star Frame die set is so fun with a starred circular frame along with 3 star dies of various sizes. 4 dies total. Starred circular frame die measures: 3 1/8" diameter; outer large star die measures: 1 3/4" x 1 3/4"; middle star die measures: 1 1/8" x 1 1/8"; inner small star die measures: 1/4" x 1/4". Our Exclusive Steel Dies are proudly made in the USA. Memory Box craft die featuring leaves in a circular frame. 100% steel craft die from Memory Box. For use on cardstock, felt, and fabric. Cut, stencil, emboss, create. Use in most leading die cut systems. This set of 5 scroll frames features stitching on both the inside and outside of the cut line, enabling you to use the cuts as both layering mats and window openings, both with the stiching detail. The dies measure: 3.75" x 5"; 4" x 3"; 3" x 2.25"; 2" x 1.5"; 1" x 0.75". Our Frantic Stamper Precision Dies work in most consumer table top die cutting machines such as the Cuttlebug, Big Shot, vagabond, Boss Cut, and Grand Calibur. Some dies may require the use of a metal shim depending on your machine. Penny Black Craft Die featuring a square and circular frames. Cheery Lynn Designs dies. Sizes: 4 5/8" X 4 5/8" (117mm x 117mm), 3 3/16" x 3 3/16" (80mm x 80mm), 1 3/4" x 1 3/4" (44mm x 44mm). Compatible with: L4, XL-4, L5, XL-5. 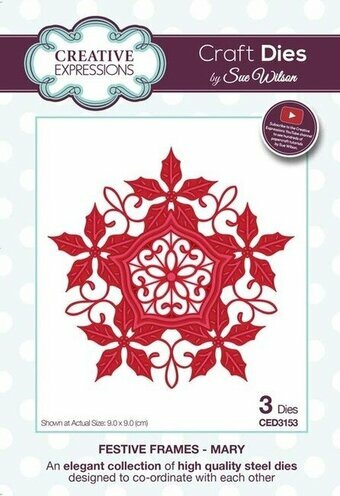 Use this ornate Festive Frame on it's own, or use it with the coordinating stamps for a perfect design every time. Coordinates with stamps UMS847 "Carol's Festive Gifts" and UMS848 "Carol's Festive Bells". Includes 4 dies. Size: 4.5 x 4.5 inches. This festive frame features poinsettias with ornate swirls that are perfect for Christmas cards and scrapbook layouts. Includes 3 dies. Size: 3.5 x 3.5 inches. Use this ornate Festive Frame on it's own, or use it with the coordinating stamps for a perfect design every time. Coordinates with stamps UMS845 "Eve's Holly Ring" and UMS846 "Eve's Holly Ribbon Frame". Includes 6 dies. Size: 5.1 x 5.1 inches. Creative Expressions Frames & Tags Collection Ella. An elegant collection of high quality steel dies designed to co-ordinate with each other. Designed by Sue Wilson. Includes 4 craft dies. Size: 3.9 x 3.9 inches. Creative Expressions: Paper Cuts Collection - Wildflower Frame. A great set of dies that include an outside decorative frame as well as a bouquet of wildflowers. Can be used together or separately for more flexibility. 2 dies. Size: Smallest: 2.0" x 3.50", Largest: 4.40" x 5.25". 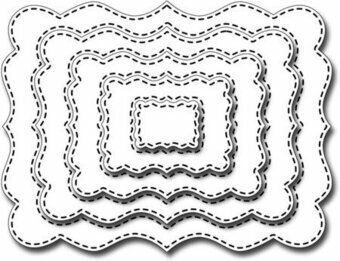 Sue Wilson-Shadow Box Collection-Scalloped Lattice Frames - Set B. Designed by Sue Wilson these cutting dies are an elegant collection of high quality steel designed to co-ordinate with each other. 5 dies. 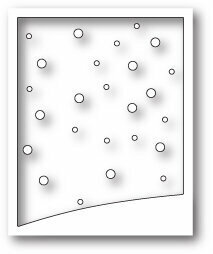 Sizes: Outside Frame: 5.90" x 7.10", Scallop Background: 3.60" x 4.75". 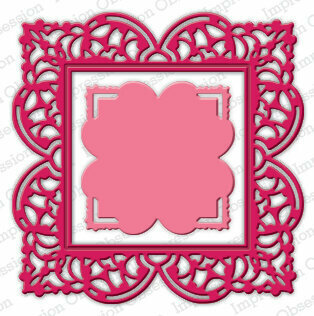 Paper craft die from Ultimate Crafts featuring a Damask Frame. Memory Box craft die featuring the word "Wish" in a square frame. 100% steel craft die from Memory Box. For use on cardstock, felt, and fabric. Cut, stencil, emboss, create. Use in most leading die cut systems. Craft die with coordinating stamps featuring hearts, "Sending Love", "Hello", "Thinking Of You", "Love You", "Thank You", and "Mr. & Mrs.". Hero Arts Stamp and Cuts are a collection of clear stamps centered around a common theme combined with a coordinating metal die-cut. Stamp first and then cut out using your favorite die-cutting machine. Both stamps and dies are made in the USA. Impression Obsession die featuring ovals. This die measures 3-3/4 x 5 inches and cuts out multiple nesting frames at once. These are US-made steel dies compatible with most table-top die cutting machines. 4" x 6" set of Christian clear stamps featuring the words "Amen", "Prayer", "Worship", "Hallelujah", "Praise", "Forgive", and more. Marianne Design Anja ornamental frame. 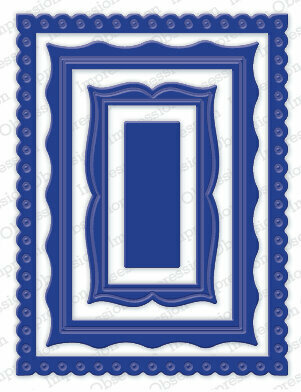 This ornate and decorative frame is a great fancy addition to your projects. 6 pcs; Size 5.25" x 5.25". Marianne Design Creatable - Anja's Label Frame & Flowers. 3 dies-1 outside solid frame, 1 decorated frame & 1 die with 5 flower shapes. Sizes: Flower Die: 2.25" x 2.50", Outside Frame: 3.95" x 5.30". 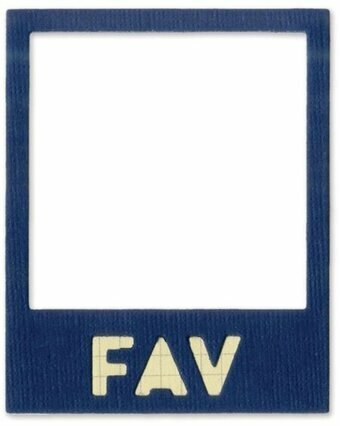 This elegant set of 3 dies includes a large rectangular frilly frame measuring 3.75" x 5", and smaller frilly frame measuring 2" x 3.25", and a small embellishment piece measuring 0.65" x 1.5". Our Frantic Stamper Precision Dies work in most consumer table top die cutting machines such as the Cuttlebug, Big Shot, vagabond, Boss Cut, and Grand Calibur. Craft die featuring a frame with birds. Craft dies featuring a bee and flowers. With Hero Arts Frame Cuts, that perfectly match our coordinating stamps, you can add architectural form and tidy framing to your cardmaking, stamping projects, and more. They are of solid metal construction with a sharp and durable cutting edge. Ideally designed to work with most papers and other thin materials. Universally compatible, they make it easy to align around your stamped images. Craft die with coordinating stamps featuring a butterfly and flowers. Hero Arts Stamp and Cuts are a collection of clear stamps centered around a common theme combined with a coordinating metal die-cut. Stamp first and then cut out using your favorite die-cutting machine. Both stamps and dies are made in the USA. Craft die from Yvonne Creations featuring a Christmas Scene Square Frame. Christmas themed craft dies featuring trim, ornaments, and a star for a Christmas tree.. Coordinates with LP418 Christmas Time Trimmings. Hero Arts Frame Cuts are wafer-thin metal dies that pair perfectly with our stamp designs.